My Macbook Pro turned into a space heater after the CPU was pegged out. The process that was running over 100% was Code Helper. This happened while VS Code did not have focus (I was using Chrome at the moment). I'm tempted to open a new issue but I'll just add to this one. Last time I opened an issue about the crazy Code Helper.. which btw doesn't even quit after you quit VSCode!!!!!!!!!! Well yet again my Code Helper in Activity Monitor was going at 99% CPU.. and I did use the Open Process Explorer and it was not helpful at all! See below screenshots! These were taken at the same time! @mjbvz It happens to me a lot on mac with all versions including the very last insider build. It mostly happens with projects with very big .d.ts files. I can almost always reproduce it after working for a while with nativescript projects. They use an android.d.ts which is really big. @mjbvz just facing it right now. CPU to 100%, vscode stuck searching after trying to click on a reference to open it. 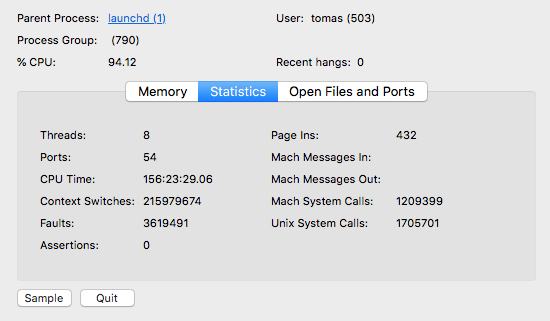 I am experiencing this issue too on my macbook and imac, both running macOS HS 10.13.5. The process continues even when VSCode is closed. @farfromrefug Thanks. I don't see anything suspicion in the TS server log. Can you check the full process arguments of the process that has the high cpu usage. Is it the tsserver one? @mjbvz always using the latest insider ! This is happening specially when I have multiple instances of VSCode open. With 3 projects I got at least 12 different Code Helper processes, all of them running at 100% (or more). The screenshot above is for one instance of VSCode open with 3 folders within the Workspace. @mjbvz any news on this? now the thing is just to play with it, asking for definition, waiting for pop over, and things like that. That should bring you to android.17.d.ts. That's the big one. Now I am not sure how fast this will happen but it should. Also as @LeonardoBraga I don't know for sure if it is related to multiple windows. I mostly always have a few opened. Happens with all plug-ins disabled, POJS. Started with the installation of 1.25.0. Code base is quite large, several million lines. On any type of file, after working for a while it takes a few seconds to save a single file. (This also excludes the fact my laptop turns into a space heater once it starts doing this.) A restart fixes it, but it comes back after a while again. File 200+ lines in a medium+- TS project - any change / autocomplete /save causes 99% CPU FOREVER. tried debugging it for 8 hours it seems like many props on an item in a big file cause it to slow down until eventually, it fails. I can now reproduce it on a whim, but can't do my job and write new code AT ALL. for the time being, I'm going back to IntelliJ but I'm looking forward for a fix. For those who are not using TS. It could be Import Cost plugin. Disabling Import Cost completely reduced Code Helper %CPU from 100 to 5. Until that issue is fixed I would be disabling Import Cost. Don't have Import Cost installed and still experiencing the issue. Same. I managed to reproduce this without any plugin enabled / installed. On Fri, Aug 17, 2018 at 11:56 AM Makan Dey ***@***. ***> wrote: Don't have Import Cost installed and still experiencing the issue. — You are receiving this because you commented. Reply to this email directly, view it on GitHub <#51776 (comment)>, or mute the thread <https://github.com/notifications/unsubscribe-auth/AFl9RGP6lBVSyGz338JJhmMf_H0QzZKuks5uRoVOgaJpZM4UmbvI> . I'm not sure if it's 100% related to this bug, but I can reproduce this by running npm install on my Node projects while I have the project folder open in VS Code. I suspect that the Code Helper goes crazy trying to index all of the new files that npm is creating. I don't use TypeScript and I don't have the Import Cost plugin, but sometimes I have the same issue with Code Helper going wild on one of the CPU cores and the culprit is electron_node index.js judging by the process explorer. When this happens to me, I notice there's a progress bar under the explorer label (the one on top of the side bar) running continuously even when there's no file or folder open in the editor. As soon as I kill electron_node index.js from the process explorer, Code Helper stops and the progress bar disappears. Last time happened yesterday, with vscode version 1.26.0 running on macOS 10.12.6. @MastaCoder Thanks. My issue went away when I uninstalled Import Cost. Probably a TS Server hard bug they can't fix, or maybe a fix that hasn't been released yet. To temporarily get around this until they have a fix, I turned on logging like the @mjbvz said, figure out which file it is croaking on, add that file or set of files to my "files.exclude", "files.watcherExclude" lists. i try to set the 'file.excludes' items but it does not work, then i uninstall the tslint extension, seems the problem fixed now. Same here. 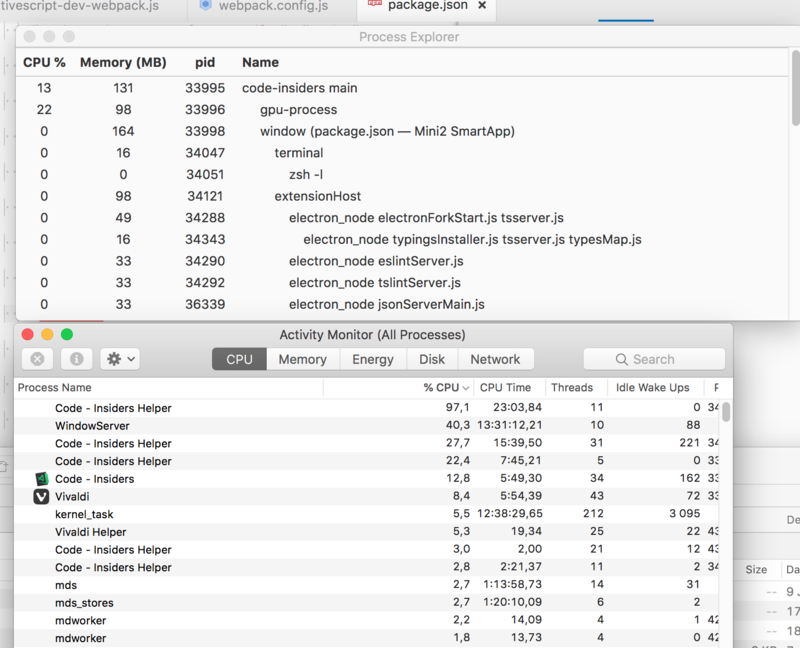 I constantly have to force quite "Code Helper" which is using 100% CPU on my MacBook using the latest (1.26.1) version. Edit: Had Import Cost enabled. Will disable and see if this fixes it. I've been having the same issue. My hunch is ESLint and Prettier but I'm not sure. The most effective changes were disabling continuous validation, limiting the watcher and disabling files.useExperimentalFileWatcher. Doesn't seem to work. I have node_modules in my exclude and watcherExclude list, but still scanning that directory. useExperimentalFileWatcher is false by default. I'm going back to Vim until the next VSCode release comes out. This message is probably useless for those who will be debugging the issue. But anyways here's "workaround" I made to keep using vscode. I removed vscode as well as all it's settings and all plugins. I installed it from scratch and added some most important plugins I use. I see no CPU consumption unless I really do something. @mjbvz, sorry, I seem to have missed the notification for this issue. I just upgraded to 1.27.2. If I see any issues I'll open a new issue. I had this issue a couple days ago. It went away when I uncommented "typescript.validate.enable": true in my global settings, altho I wasn't even working in a typescript project - no tsconfig / jsconfig. I think it's safe to presume the latest update has caused this. Disabling extensions is not enough. I solved it by uninstalling ms-vscode.csharp en then reinstalling. Plays nice at around 0.4% now. I think Code Helper is kind of a shared lib that get's instantiated several times, once per each installed extension that requires/uses it (or not, and i can be totally wrong!). That's why several users reported the problem got solved when they disabled extension X or Y. In my case: after several hours facing 99% CPU loading and fiddling with a minimum set of extensions, and even enabling/disabling some extensions settings, I found out that the culprit was the Settings Sync extension. When I set sync.autoUpload=false all other extensions run nicely and Code Helper started to behave and not stressing out CPU anymore. Reporting this to extension authors. I'm locking this issue because it is not the correct place to report these problems. If you are seeing a bug with high cpu usage, please open a new issue and we will continue to investigate.